The members of SAA’s Committe on Public Awareness (COPA) have gathered in Chicago this week to review and rework our work plan for the next year. With #AskAnArchivist Day fast approaching (it’s this Wednesday, October 4th, in case you missed the announcement), we’re dedicating a chunk of time today to get ready our favorite day of the year. …so we’re creating a few more today for a last promotional push. 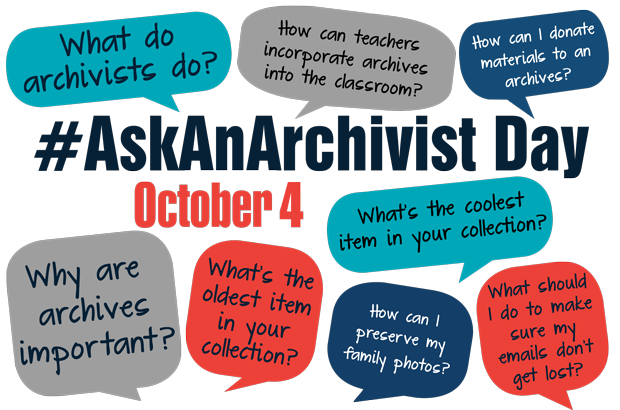 Think you can top these #AskAnArchivist Day promotional memes? Share yours on Twitter today and tomorrow to build up momentum heading into Wednesday! Don’t worry, we’re not spending our entire in-person meeting creating memes. We’ve also come up with a number of questions that we plan to ask throughout the day on Wednesday so that COPA can join the conversation and hear about your archival outreach successes…and failures. “What’s an archivist?” elevator speech in 140 characters or less. Go! What has been your favorite outreach event that brought people to your archives?